Can you tell I’m using up my last little pieces of fabric? I have so many pieces of fabric too big for the scrap box but too small to be in with my normal stash. This little houses fabric was left over from this quilt. This one is also in the shop. I love those little houses! I need some of this house fabric. Who makes that fabric? You are doing such a great job using up all your strips/stash. It's something I have to work on. I just love every quilt you make! You and I must have the same taste because your fabric choices just really resonate with me. It’s so cute! The houses are so tiny and adorable. Good job using up your stash, I’ve been trying hard to do that too, it’s extra rewarding don’t you think? I'd like to find some house fabric, what is it called? I adore all those wonderful pinks!! it is beautiful, as all your quilts are. "but there's a 90% chance I'd hit a tree"
So cute! LOVE the backing! Beautiful quilt, just love the fabrics you have chosen. I like the pattern you have used, I would like to make a baby quilt for my sister's baby due in May could you please give me some measurements it would be greatly appreciated. 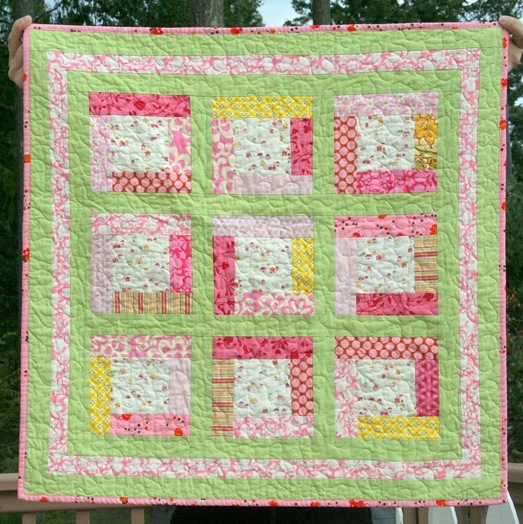 this little quilt is adorable…i am inspired. Gorgeous. 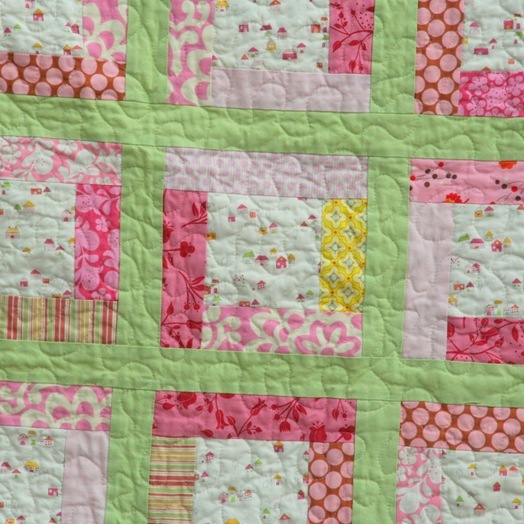 I always love seeing quilts that are appropriate for a little girl but aren't too baby-ish. Abba-lute-ty gorgeous! I love your quilts, your blog has inspired me to start quilting again recently. Thank you for sharing! I love it! The houses are so adorable! You're killing me with these backing fabrics lately. Love these mopeds! Cute! Love the scooters on the back. Love it and you can't tell it is from scraps. So cute!!! I have to say, I was making Christmas Dresdens for a runner…and when I saw your Christmas pillows…I knew I had to make pillows and a runner!!! Whoa! Here I am having a hard time getting ready for Christmas (still a couple little things to make) and you tempt me with this lovely little quilt that says "SPRING" all over it. Delightful colors. Reminds me of sherbet! I absolutely LOVE the colors in this quilt! Not to mention those too cute scooters. My scooter is in pieces in the garage, it was supposed to be my husband's winter project LAST year. I had someone come into my shop today that had made your applique tree pillow!!! So cute!! They had done it in aquas and greens. I loved it!! What a lovely quilt. I love the little houses fabric for the middle of the blocks. Are you planning on doing a tutorial on this? I love your tutorials, I am learning so much byy reading / following you. As a new quilter, I cannot thank you enough!! If no tutorial is planned, where can I get this pattern?